What do these words make you think of: corporate team building. Maybe you roll your eyes and groan while imagining the lame litany of possibilities: direct leadership lessons (organized neatly in a 2 hour power point format of course), practically applied hand holding (how is it possible for palms to sweat so much? ), drum circles (everyone knows Tim from accounting doesn’t have rhythm) or the ever-popular trust fall exercises (just how many times can you legally let someone fall?). If this is what you hand in mind, you are way off base (thank goodness!). Rest assured, we’ve got something special your next team outing. Give everyone a break with a corporate team building activity that is deceptively entertaining and requires absolutely no time spent in the blistering cold. Get Out-of-the-Box and into the indoor wind tunnel for some indoor skydiving. Wondering why? When you are trying to facilitate team growth, it’s best not to force the corporate stuff. Research has shown the most effective corporate team building activities are those that encourage employee engagement without seeming forced. They might be able to snooze through that riveting presentation about effective communication, but they’d be hard pressed to close their eyes on an exciting time like an indoor skydive. 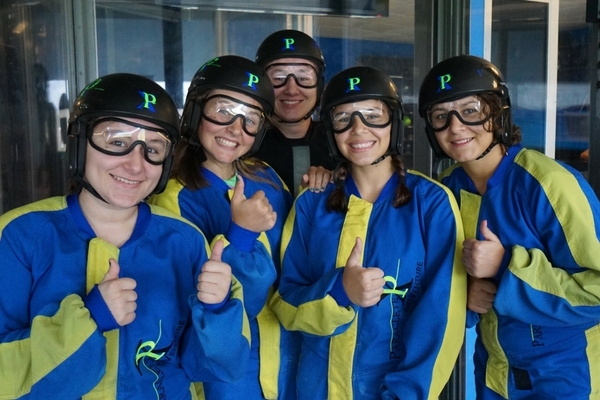 When it comes to fun team building, indoor skydiving is where it’s at. By stepping outside of the usual and anticipated indoor team building activities, you stimulate interaction amongst the group, improve communication, and bring everyone a little closer together. Is your break room like a wake? If so, that dreary lack of energy might be contagious. Sledding in some slick wet slush will only damper spirits more. Fortunately, enough for you, we’ve got the remedy. Pump up the positive vibes with indoor skydiving. Positive company culture has been consistently linked to increased productivity. Increased productivity means benefits for your bottom line. With indoor skydiving, you enable your employees to connect and interact in a new way. This makes it easier to keep the excitement going and to keep the positive energy charged throughout the year. Sun burns, ant bites, tiny sandwiches, and luke-warm potato salad: ahh the classic company picnic. While this all sounds grand, it’s not exactly winter friendly. So, perhaps a new fun and motivational corporate team building activity is in order. Indoor skydiving is slightly outside of most people’s comfort zones but safely enough within reason to not be terribly jarring. Getting your group together to try something new can generate some seriously good energy and subsequently, encourage them to bond in a new way. There’s nothing quite like a “first” indoor skydiving session to connect your team. The mutual excitement will foster genuine connections. Plus, the activity encourages group collaboration, which just happens to be a vital part of the successful and timely completion of workplace projects. Can you say win, win? 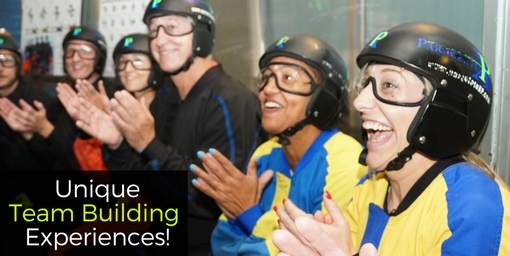 Be a winner this winter with your team, choose a memorable team-building activity like indoor skydiving. One of the coolest experiences with a great staff of professionals who you can tell really enjoy their jobs. The facility is top notch offering the perfect environment for viewing all the action in the tunnel. They are also really great with little ones.